To share a lesson plan guide to help middle/high school teachers better plan for their lessons. Typically, middle/high school teachers have students sit in squad lines after dressing for PE. This format makes it convenient to take roll and organize students into teams, etc. Unfortunately, this practice can eat up time in which students could be active, warming up, or mentally preparing for a lesson. The following is a suggested outline for a middle or high school lesson that may be helpful to those in certain teaching situations or conditions. It is understood that this may not work in all situations and environments. Students will often times straggle in from changing in the locker rooms, therefore a traditional instant activity at this time may be highly ineffective. Have some simple tasks for the students to do that may be interesting to them, and can be done alone or in twos or threes. You can take roll as students straggle in, and be ready for a traditional instant activity when the bell rings as all students are supposed to be in the gym by a certain time or by the bell. Please take a ball and practice your forearm bump to yourself. Focus on the cues: elbows locked, hands together, and thumbs pointed at the floor. They are posted on the wall just in case you forget. Find a spot on the wall and see how many consecutive bumps you can get to hit this spot (may want to put targets up). If you feel successful with this find one or two other people and go for a record bumping back and forth. Use only bumps, any other kind of hit and you must start over on your record. You can now do a group instant activity that is fun and gets the students communicating and engaged in your lesson. Sit down facing a partner quickly. Clasp wrists and see if you can pull each other up at the same time. Find another pair and see if you can pull 4 up at one time. If you get 4, go to 8, etc. You will notice that this activity has nothing to do with volleyball. This part of the lesson may or may not relate to the lesson focus which is coming up next. These activities tend to motivate and energize the class, and usually take 2-3 minutes. You have your students where you want them now. Thus, it is time for a set inductionto engage their minds in your lesson. Example: Set induction for spiking (your lesson focus). Have you ever watched volleyball in the Olympics? (If it is convenient for you show video of great volleyball match on a TV or have them look at it on their phones). What is one of the most exciting ways to score points in a volleyball game? That's right, spiking! Today we are going to learn and practice how to spike the volleyball so that we too can score this way. The next part of your lesson is: The lesson focus! Planning the lesson focus is crucial. You have a skill that you would like to focus on and teach for the day. Teach one cue at a time and keep a brisk pace so that students do not become bored. Take this into account by having numerous tasks, refinement cues, and extensions of tasks. Shoot for middle of the road, and vary the tasks to meet the needs of the more and less skilled. Move around the room and give different groups different tasks based on what you are observing. Below you will find an example of this in a format that should look very familiar to you. It is by no means complete, but gives you an idea of how this might be approached at this level. A highly skilled student might go through these 5 in 2-3 minutes, whereas a less skilled individual may continue to work their way up to application #2 in 5 minutes. **It is extremely important during this part of the lesson to focus on individual skill development by using the cues for feedback. Students will improve if they focus on their own individual skill development versus comparing themselves to their peers. Middle and high school students are heavily into social comparisons at this time, and we should not compound this problem by magnifying it by the design of our lessons. Note: It may look like the table above got cut off at the bottom. It did not. All content is there. This segment of the lesson focus should have a brisk pace. You may only want to spend 5-10 minutes in this phase of the lesson (of course this is dependent upon what you are teaching and how the students are doing). The next part of the Lesson Focus can be more game like. The games that students play should allow for maximal practice opportunities and focus on the cues learned in the prior phase of the lesson. These may be self, partner, small, or large group activities. Remember, large group activities lend themselves more to social comparisons, and also make it more difficult to give individual feedback regarding performance. The following is an example of how we might continue our spiking lesson. Example: Game like portion of lesson focus. Spiking practice. In the middle of the gym, you have already set up numerous standards with a slanty rope (or net) between them (4 feet up to approx. 7 feet). Have students get in groups of 3-4 and get across the net from another group of 3-4. Each person gets a low density foam ball (very light weight, or any light weight ball will work) the size of a volleyball. The object of the game is to practice your volleyball spike over the slanty rope and try to hit the opposing teams floor with your spike. You may spike the ball from any point on the rope. If you miss the opponents floor space or it does not go over the rope then run to the wall, pick up a volleyball, practice 3 spikes to the wall, put the ball back down and run back to the game. Depending on how this activity is going you may play it for 5-10 minutes. Assessment: How do I know and/or show what the students have learned in this lesson? The effectiveness of your lesson will depend on what the students have learned. You need to know what they have learned because this will guide the development of your next lesson plan. You want to meet your students where they are at. Many middle and high school programs are strictly into performance assessment (how well the students can perform the actual skill). These types of assessment are fine, but I suggest that you add a cognitive component to your assessment. Example: Gold medal finals expert analysis. 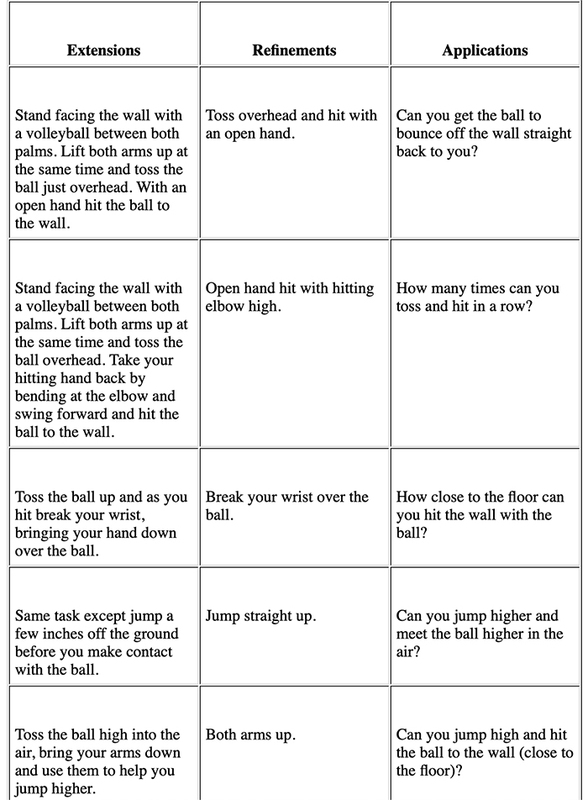 The team that you were on for spiking practice game is your group for this assessment. You are the commentators for the gold medal finals of the Olympic games in the upcoming city it is taking place (men's or women's - your choice as a group). Create a 2-3 minute segment which will tell the viewing audience that you really know your stuff about spiking. Focus on the cues that we learned in class today (hit with open hand, hitting elbow high, break wrist down over the ball, jump straight up, etc.). You may just be a team of analysts, or you may have some footage of some Olympic players in your segment, the choice is yours. Have fun with this, but make sure to let the viewing audience know that you really know your stuff. We will video these segments at the beginning of class tomorrow. The final phase of your lesson is closure. Have the students help you bring in the equipment and get it set for the next class. This should be extremely quick. Bring all students together and remind them of what is happening tomorrow, or things that they need to think about from the lesson today. Ask any questions you would like of them regarding the lesson or future activity (tomorrow), and then let them go. Everyone stop what you are doing and gather all of the equipment into the bins. Please walk over here when you are finished. Go! Today we worked on spiking, and tomorrow we will learn what you have learned in class today. As I went around and watched and listened to you develop you commentator sketches I think that you have learned quite a lot today about spiking. Remember when you do these tomorrow. The first whole group in the gym tomorrow will get to go first. The rest of you can practice your sketches when you come into the gym. Have a great day, and I'll see you tomorrow. As the class is breaking up and heading for the locker room you can have any one on one conversations with students that you think are necessary, these don't have to be negative or punitive. You may just want to get to know a student better, or you noticed something different about their behavior today (positive or negative) and just want to check to see if things are OK. Submitted by Ken Bell who teaches at Boise State Univ. in Boise, ID. Thanks for contributing to PE Central! Posted on PEC: 1/18/2019. Viewed 363936 times since 8/24/2001. I do not even know the way I stopped up here, but I believed this submit was great. I don't realize who you are however certainly you are going to a famous blogger should you are not already ;) Cheers! EXCELLENT lesson plan format! Wish more teachers would use this. This is a great way to engage the students immediately and they would enjoy it. Is stretching before and after activities ever a part of an A.P.E. lesson plan, especially if the eval. shows specific muscle group tightness? Excellent detail on the steps throughout the lesson plan. What is the reason for trying to hit the opposite team in the Spiking dodgeball? Could they be aiming for a hoop on the floor instead?